Email must be formatted correctly. Build your team a beautiful Gantt chart with a single click. I’m very pleased to announce that today we’re launching Redbooth’s Timeline view. After months of user interviews, collaboration, and hard work, it’s ready for you to use! Now you can transform any Redbooth project workspace into a beautiful, easy-to-understand Gantt chart. If you’ve never thought of visually planning out your work in a timeline, I’m excited for you to try it. I know it’s a bold statement, but the introduction of Timeline view could change the way your team plans and tracks all its projects. Gantt charts historically have been popular with larger, enterprise-type corporations. Most of the time, creating and maintaining these visual project plans is complex. We’ve taken the essence of what Gantt is meant to do and brought it to smaller teams and companies. We’ve also made it more collaborative. 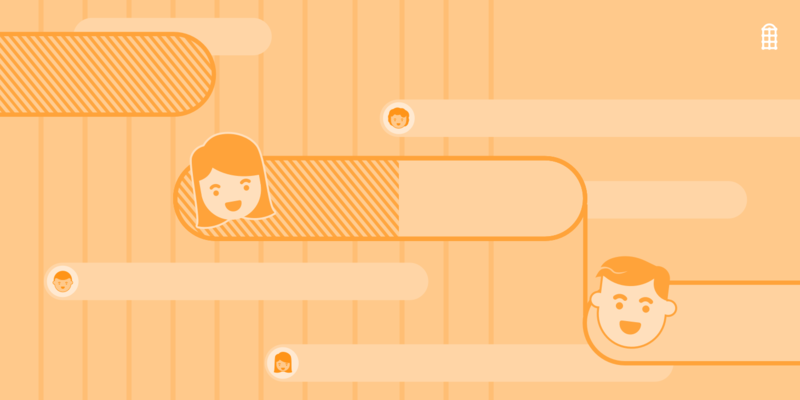 Read on to discover three reasons why we’re so excited about bringing Gantt charts to you — and why we think your entire team is going to be excited too. We did a lot of user research. We learned that our customers enjoyed using Redbooth to track all the tasks involved in their projects. However, what they couldn’t do — up until now — was see how long it would take to complete each task. So the workspace functioned as a sophisticated interactive checklist. To map out a project over time, our customers were using other tools in combination with Redbooth. Detailed spreadsheets and giant whiteboards were two of the most popular options. The problem was that a whiteboard doesn’t go anywhere. It stays in the office, and it certainly doesn’t update itself as you make progress. But being able to visually plan a project was so valuable to our customers that they mapped out entire projects on those whiteboards. Open up a workspace right now: Add start and end dates to your tasks and click “Timeline view.” Your Gantt chart is ready! It made the project feel less abstract and easier to internalize. When you have a plan, when you can see that plan, your entire team feels more confident. With Redbooth Timeline view, you can have that visual plan — no whiteboard needed. In a traditional Gantt chart model, the project manager manages the Gantt chart and inputs all changes. Why not just stick with that model? Well, it creates a lot of challenges. I’ve worked at a 300,000-person multi-national corporation, and there was some value to centralizing certain processes. But small-to-medium companies, agencies, and firms have different needs. So for these users, we wanted to make Timeline view accessible and also easy to use for everybody. You shouldn’t have to be a project manager, a team lead, or a power user to use a Gantt chart in Redbooth’s Timeline view. It’s valuable for everybody to see the big picture of a project and be able to make updates as needed. When you collaborate, you’re working with lots of different people. They’re going to have varying comfort levels with technology. That’s why we made it simple for everyone. Creating a perfect project plan is very satisfying — but then life happens. Things change. If your plan is set in stone, you’re going to run into trouble. With Redbooth, as you’re working through your tasks, you make updates as you go: changing deadlines, updating task owners, and so on. Here’s the great part: Make those changes in tasks, and they’ll automatically update in your Gantt chart. Make them in the chart, and they’ll automatically update in your tasks. This way, you can start out with a great plan. And then as things come along, it’s incredibly easy to update and adjust your plan accordingly. Anyone on the team can visually understand where your project is in any one point in time. For instance, let’s say you can’t start coding the new web page until the design is approved. If the design is running behind, you can drag and drop the task in the timeline to adjust for it. In Timeline view, you can create “dependencies” on your project timeline, linking one task to another. Everyone can see what the impact is when you’re running behind on something. This helps the team make different choices to keep the project on track. If a task is overdue and the deadline hasn’t been adjusted, you’ll see that clearly in your first glance. We wanted to make sure that things like that are easily visible for you so that you can make adjustments or address the issue as needed. Redbooth also keeps a record of all your completed tasks. This way, you can look back at the end of a project to try to understand what went well and what needs improvement. It’s easy to spot what the bottlenecks and challenges were. With this knowledge, you can plan better for your next project. With the release of Timeline view, we also added a host of new little features to help you plan and manage projects. Some of these are in your task list view (what you see when you’re not in Timeline view). Previously, you could only set a deadline for a task. Now you can set a start date and a due date on your task. We’re excited about giving you the ability to plan and measure task duration. In the past, you could mark a task as urgent, but the “urgent” status replaced the date. Now you can have a due date as well as an urgent status. This helps you better manage tasks that are important but not necessarily tasks that you can complete in full today. Of course, all of the features that our customers already love about task list view are still there. You can still drag and drop tasks, assign and reassign tasks to owners, add and check off subtasks, discuss tasks and upload files, and more. I want to recognize our very talented development team in Barcelona, as well as our talented UX/UI folks here. Without them, none of this would have been possible. Most of all, I want to thank the entire Redbooth user community. We are especially grateful to the customers who participated in our early access program. They generously shared their insights, feedback, and engagement with us to benefit all users. How will we measure the success of Timeline view? It’s simple: We want you to become even more efficient at planning their work and tracking your progress. And we want it to be easy to use. Easy for you — and for your clients, for your managers, or anybody you want to keep updated on your work. We want you to recapture the time you’ve spent drawing charts on whiteboards, chasing down updates, or reinventing the wheel. We hope that Redbooth Timeline view becomes a useful tool in your Redbooth toolbox that helps you focus on what matters most to you and your business. New to Redbooth? Get started for free, including the new Timeline view. Irwin is a Director of Product at Redbooth. A San Francisco native, he has spent more than a decade working in Silicon Valley delivering products that delight customers with such companies as HP, Barnes & Noble, and Shutterfly. When he's not dreaming up innovative solutions to help Redbooth customers get more work done with greater efficiency, he's out improving his golf game or tinkering with tech toys and new electronics. Security, Compliance and Data Privacy.